Tokyo,the capital city of Japan, is the most expensive city to live and it is the largest metropolitan area in the world. Earlier Tokyo was a small fishing village known as Edo. 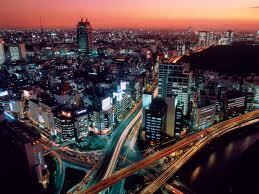 The name was changed to Tokyo when it became the capital of japan in 1868. In the beginning it was pronounced as "Tokei" and later changed to "Tokyo". In the 20th century, Tokyo faces two extremely large-scale disasters and it recovered from both. One is 1923 Great Kanto earthquake (killed around 1.5Lakh people) and the other one is Second World War. Tokyo is the city hosts highest number of Fortune Global 500 companies(47) in the world. It is one of the three "command centers" for the world economy. New York and London were the other two. The city hosted Olympics in the year 1964. Tokyo celebrates many festivals. the Sanno, the Sanja and the biennial Kanda are the major festivals here. The city has many museums in it. The Tokyo National Museum,the Edo-Tokyo Museum, the Nezu Art Museum and the National Museum of Modern Art were the familiar museums here.